With the aim of reintegrating former soldiers into post-civil war society, young men from underprivileged backgrounds are trained in building techniques through their involvement in the construction of public buildings – such as this Community Library. The slender building sits lightly in the landscape and wraps around an inner courtyard, taking full advantage of cross ventilation and daylighting. Rammed-earth walls and recycled materials reduce the building’s ecological footprint. The Dryline (or BIG U) project addresses the vulnerability of New York City to coastal flooding and proposes a protective ribbon in Southern Manhattan. The master plan uses a raised berm to create a sequence of public spaces along the raised bank at the water’s edge. The infrastructural barrier incorporates a range of neighborhood functions and as a result offers multiple design opportunities, fostering local commercial, recreational, and cultural activities. 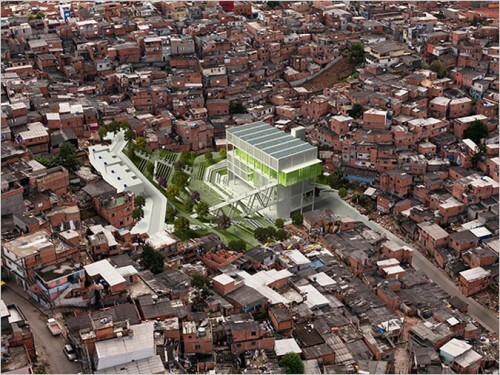 The Holcim Foundation for Sustainable Construction in Zurich, Switzerland has announced the winners of its 2012 Global Holcim Awards and the Holcim Innovation Prizes. Regional prize winners (15 for Global Awards and 53 for Innovation Prizes) were examined, and from them 3 Global Awards and 3 Innovation Prizes were handed out to projects that address environmental performance, social responsibility, and economic efficiency. Each of the winning projects are innovative, future-oriented, and usually have a social or cultural component as a key part of their program. This year's jury for the Global Awards was headed by TEN Arquitectos' Enrique Norton and included critic Aaron Betsky and architect Mario Botta. The Innovation Prize Jury was led by architect Harry Gugger and included economists and engineers. Global Holcim Awards 2012 Gold Secondary school with passive ventilation system, Diébédo Francis Kéré, Kéré Architecture Gando, Burkina Faso Silver Urban remediation and civic infrastructure hub, Alfredo Brillembourg and Hubert Klumpner, Urban Think Tank São Paulo, Brazil Bronze Urban renewal and swimming-pool precinct, Tim Edler, realities united, Jan Edler, realities united, Denise Dih, DODK Holcim Innovation Awards 2012 1st Prize High-efficiency concrete formwork technology, Matthias Kohler, Gramazio & Kohler, Architektur und Digitale Fabrikation – ETH Zurich, Fabio Gramazio, Silvan Oesterle and Axel Vansteenkiste, Gramazio & Kohler, Architektur und Digitale Fabrikation – ETH Zurich Zurich, Switzerland 2nd Prize Low-cost apartments incorporating smart materials, Frank Barkow, Barkow Leibinger Architects, Prof. Regine Leibinger, Barkow Leibinger Architects and Technische Universität Berlin, Institut für Architektur, Fachgebiet Baukonstruktion und Entwerfen, Prof. Dr. sc. techn. Mike Schlaich, Technische Universität Berlin,Institut für Bauingenieurwesen, Fachgebiet Entwerfen und Konstruieren - Massivbau, Germany; Matthias, Schuler, TRANSSOLAR Energietechnik Hamburg, Germany 3rd Prize Efficient fabrication system for geometrically complex building elements, Povilas Cepaitis, AA School of Architecture, Luis Enrique, Diego Ordoñez and Carlos Piles, AA School of Architecture London, UK Click on a thumbnail to launch the slideshow. 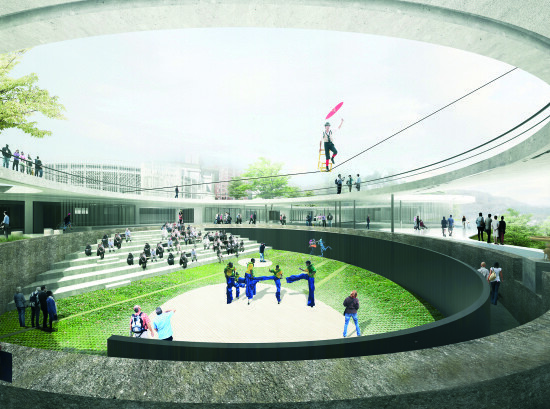 All images courtesy Holcim Foundation. A complete list of finalists can be seen here.